Introduction: Laparoscopic Sleeve gastrectomy is relatively new surgical therapy for morbid obesity. The spleen receives it blood supply from the splenic artery and the short gastric vessels. 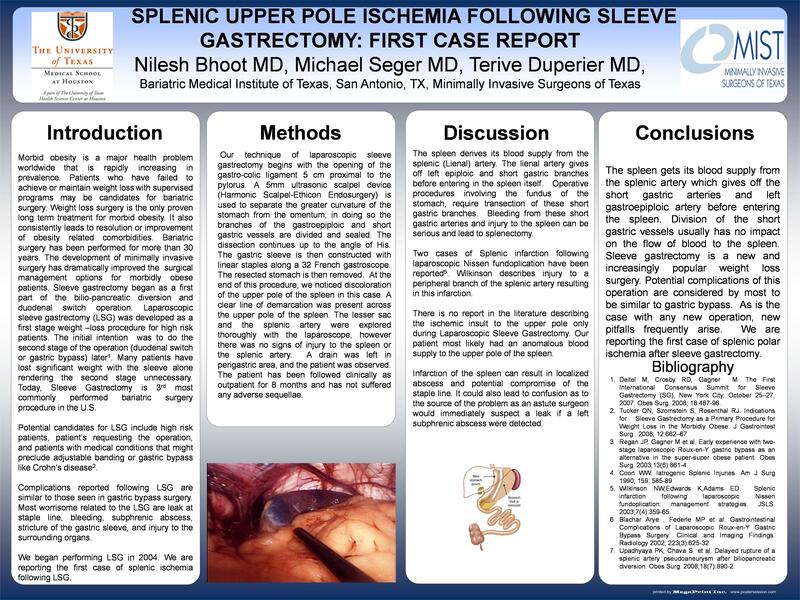 We are reporting a first case of splenic upper pole ischemia following resection of the short gastric arteries in laparoscopic sleeve gastrectomy. Material and method: Gastrectomy and related procedures require resection of the short gastric vessels either by ligation, stapling or by coagulation. Meticulous technique is followed to prevent the hemorrhage from these short gastric arteries. Our technique of laparoscopic sleeve gastrectomy begins with the opening of the gastrocolic ligament 5 cm proximal to the pylorus. A 5mm ultrasonic scalpel device (Harmonic Scalpel) is used to separate the greater curvature of the stomach from the omentum; in doing so the branches of the gastroepiploic and short gastric arteries are divided and sealed. The gastric sleeve is then constructed with linear staples along a 30 French gastroscope. The resected stomach is then removed. At the end of the procedure we had noticed discoloration of the upper pole of the spleen. A clear line of demarcation was present across the upper pole of the spleen. The patient was observed and suffered no adverse sequellae. Conclusion: The spleen is supplied blood from the splenic artery and the short gastric vessels. Division of the short gastric vessels usually has no impact on the flow to the spleen due to this dual supply. Sleeve gastrectomy is a new and increasingly popular weight loss surgery. Potential complications of this operation are considered by most to be similar to gastric bypass. As is the case with any new operation, new pitfalls frequently arise. We are reporting the first case of splenic polar ischemia after sleeve gastrectomy.